Recently, a lot of you have been wondering — in anticipation of this summer’s hottest new blockbuster, Ender’s Game — why it is, exactly, that kryptonite is so damaging to Superman. Psychologically, however, kryptonite makes sense. Superman is a compilation of America’s technological achievements. He can create supercold temperatures, he can shoot X-rays and lasers, he can travel quickly by land and air, and he is invulnerable because he is literally “made” out of steel. So kryptonite is a combination of three things. First of all, it represents the misuse of technology, which is why it sometimes turns Superman evil rather than weakening him. 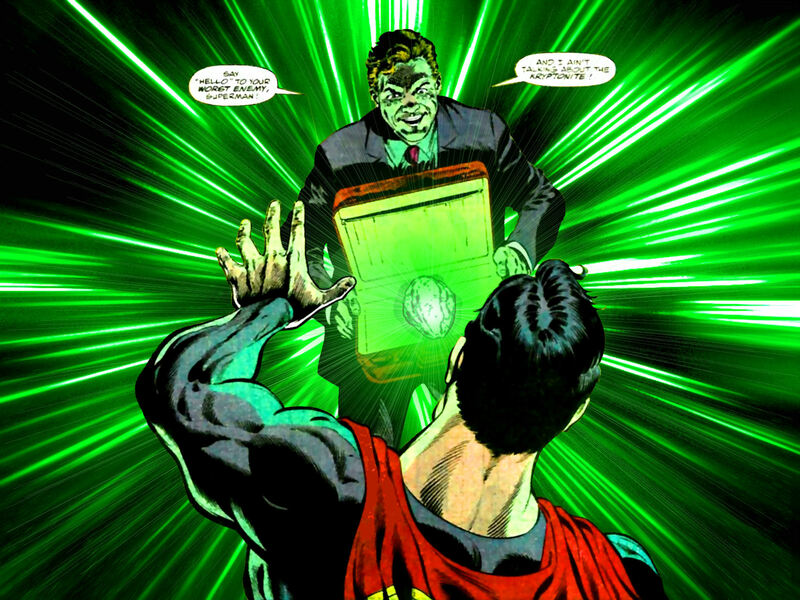 Notice the bland corporate villain in the cartoon above, who is saying “I’m your real enemy, not the kryptonite!” Second, it represents the resources that we need to create products like steel — dwindling resources are the Achilles heel of modern industry, and the presence of the stone reveals the precarious situation of technology, so that we see how “weak” and vulnerable it really is. Kryptonite is radioactive, like the most worrisome resource with the most potential misuses, uranium. Finally, and most importantly, kryptonite represents our acclimation to technology. Superman would not be a “superman” on Krypton; all of his superpowers hinge on the fact that he’s out-of-this-world. By bringing him back into contact with his homeworld, kryptonite “normalizes” him, turning him into the nebbish he’d be on Krypton. This makes it a compound of America’s anxieties about losing the technological edge and feelings of burnout in American consumers. Patton Oswalt once observed that iPods are “little miracles” we’re carrying around in our pockets, and yet nobody seems to notice or care. It’s not a blissful or miraculous experience. As it goes for iPods, so it goes for Superman as well. Kryptonite is technology’s fall from grace.